OMAHA, Nebraska, August 22, 2011 (ENS) – The leaders of seven states along the Missouri River Friday agreed to pursue an independent, external review of the U.S. Army Corps of Engineers’ management of the river system leading to this year’s historic flooding. The seven governors or their representatives met in Omaha with U.S. Army Corps of Engineers officials to discuss flood control issues. Attending the meeting were: Governor Dave Heineman of Nebraska; Governor Sam Brownback of Kansas; Governor Jack Dalrymple of North Dakota; Governor Dennis Daugaard, South Dakota; Lt. 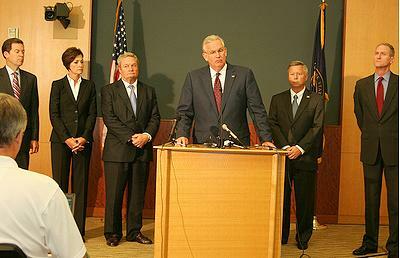 Governor Kim Reynolds of Iowa; Governor Jay Nixon of Missouri; and a representative for Wyoming Governor Matthew Mead. The eighth Missouri River governor, Montana Governor Brian Schweitzer, was scheduled to attend the meeting but did not show up. Schweitzer told The Associated Press he is “frustrated” that downriver governors want to focus solely on flood mitigation and navigation, excluding water needs for recreation and wildlife that improve Montana’s economy. Schweitzer also objected to the decision to close the meeting to the press. 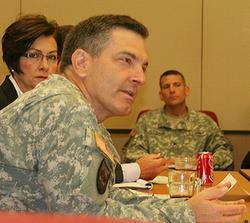 U.S. Army Corps Brigadier Gen. John McMahon attended the meeting and briefed the state leaders on the river system’s management. Extremely heavy rainfall in conjunction with an estimated 212 percent of normal snowpack in the Rocky Mountains of Montana and Wyoming contributed to the ongoing flooding event. The reservoirs of all six major dams along the Missouri River are at 100 percent or more of capacity. The Corps has been releasing record amounts of water to prevent overflow, which has flooded towns and cities along the river from Montana to Missouri. Most affected are: Bismarck, North Dakota; Pierre and Dakota Dunes, South Dakota; Sioux City, Iowa; South Sioux City and Omaha, Nebraska; Kansas City and Jefferson City, Missouri. The flood is expected to last at least three months from June through August as a result of Corps of Engineers attempts to regulate the release of water through 850 miles of river from Garrison Dam in North Dakota to the confluence of the Missouri with the Mississippi River at St. Louis. The flooding closed traffic bridges, making it impossible to cross the river for 200 miles – 100 miles between Sioux City and Omaha and another 100 miles between Plattsmouth, Nebraska and St. Joseph, Missouri. Communities in several states have been evacuated and on June 21, two women drowned in Lyman County, South Dakota after they drove their car down a washed out road. 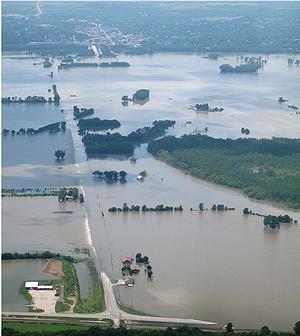 The flooding affected Nebraska’s Fort Calhoun Nuclear Generating Station, where the grounds were inundated by the flood. A state of emergency existed for six weeks from early June to mid-July, although the plant had been in safe shutdown mode for refueling since April. Waters have now receded. Some of the governors say the situation could have been managed better by the states themselves. Governor Dalrymple asked other state leaders to consider future management of the Missouri River under a state compact. He called for the Corps to establish an early warning system to notify states of flood threats based on mountain snowpack levels and water storage conditions among other factors. An early warning system could help homeowners decide if they need flood insurance and would give communities more time to build levees, he said. Dalrymple shared concerns about the timing of water releases from Garrison Dam prior to this year’s record flooding, inconsistencies in snowpack readings, and whether the Corps’ master manual really recognizes flood control as the primary purpose of the Missouri River system. Governor Schweitzer declined to sign the letter. The governors agreed to meet again in November to review the river system’s operation. As water releases from Missouri River dams begin to drop, Governor Daugaard Sunday reminded South Dakota residents to respect the still-record flows and stay away from levees protecting communities. The South Dakota governor said levees will continue to be essential protective measures for riverside communities, and he urged citizens to stay away from the levees as river levels drop.